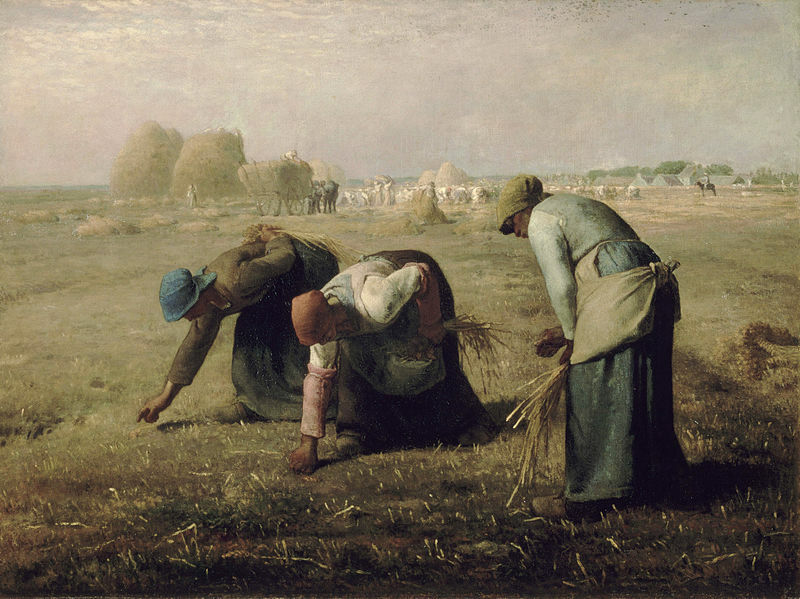 When Jean-François Millet unveiled his painting "The Gleaners" in 1857, a critic of the time expressed repulsion at three women in the foreground for “their ugliness and their grossness.” Each is bent toward the ground to a different degree, each gathering the scraps of wheat left over by the landowner’s appointed army of harvesters, who are working under the eyes of a foreman on a horse in the background. The women don’t have much. They’re in a shadow, compared to the light on the official operation behind them. It’s not evident whether they’ll gather enough of the leftover grain to make a decent loaf of bread. Not long ago, I described Millet’s The Angelus as a glimpse of a time when the workday still had an end. I find that this picture, too, has something to say about the digital economy in which we increasingly find ourselves. When you reap the harvest of your land, you shall not be so thorough that you reap the field to its very edge, nor shall you gather the gleanings of your harvest. These things you shall leave for the poor and the alien. I, the LORD, am your God. Millennia later, gleaning practices are implicit in the Magna Carta, and its companion Charter of the Forest, as a fixture of the economy that allowed medieval commoners—especially women—to survive under feudalism. The Magna Carta suggests that even a noble woman might have no recourse but to depend on her “reasonable estovers of the common”—that is, the supplies from the shared land that she needs to survive. Gleaning allowed a viciously unjust property system to survive by offsetting its worst consequences. When gleaning rights eroded with the land enclosures of the 17th century, English commoners revolted. We are, I think, becoming gleaners again. The economy that the dominant online platform monopolies—familiar names like Facebook, Google, Uber, and TaskRabbit—incline us toward is one in which we tread for our livelihoods on land we neither own, nor are employed to cultivate, nor meaningfully control. These companies derive the value of their shares from the unpaid labor we perform. We share the stories of our lives, the data of our relationships and the news that interests us. It could be said that this is a practice that we enter willingly, but increasingly participation in these services is a prerequisite for maintaining relationships and obtaining employment. There is less and less choice involved. And while the user experience of these platforms is programmed to help us feel in charge and in control, the reality of our interface is much like that of Millet’s women picking at the edges of the field. We see only tiny scraps of the information about us and our “friends” that is available to the lords of the platform. We think we are getting something for free, while we hand over our valuable data for nothing. At least Millet’s gleaners knew that’s what they were. Even platforms that pay people to work on them, like Uber and TaskRabbit, have resisted taking meaningful responsibility for their workers. (Uber, for instance, continues to insist that its drivers are not employees.) When the owning class refuses to treat workers as fellow citizens—with job security, health care, education and a decent pension—we become commoners again, depending for our livelihood on what we can scrap together. Feudalism is back. In this situation, I think, the new commoners have two options. One is to try reversing or slowing the rise of the new feudalism. We can demand certain basic rights from the platform owners, like decent pay and reasonable privacy. We can hope for something like the old industrial employment relationship, which the platforms are unlikely to grant. But we can try. The alternative is to embrace our identity as commoners and turn the commons into an economy worth living in. The platform monopolies might be replaced with platforms that we can actually own, govern and share. (I am co-organizing a conference on this option next month in New York.) The domain of private ownership might be reduced in favor of resources that we hold and maintain for common use. If the pickings are good, and people take only what they need, gleaning might someday be better than working for the landlord. That is, we can see in gleaners not the ugliness and grossness that the 19th-century Parisian art scene recoiled against. We can see, instead, their beauty and dignity and light.